Stephen A. Smith is no stranger to controversy, but it seems he may have met his match on Twitter. The ESPN commentator was taken to task Tuesday on the social media site after he weighed in on the “Black Lives Matter” movement. “Where is all the noise about #BlackLivesMatter when black folks are killing black folks?” Smith tweeted. I'm a black man. Of course I know #BlackLivesMatter. You can't boo a presidential candidate just b/c he says "all lives matter". Then Smith tweeted: “I didn’t hear Gov. Martin O’Malley’s interview. And I’m not debating the significance of “Black Lives (cont).” He was referring to “Black Lives Matter” protesters who booed Democratic presidential candidate Martin O’Malley off the stage Saturday at the Netroots Nation Conference — a town hall for liberal activists. Along with his tweet, Smith included a link to a statement on Twitlonger. His comments didn’t go over too well on Twitter, where users took him to task. “No man. No. Don’t do this,” responded rapper-songwriter Talib Kweli. “Stephen A Smith isn’t a lot of things but he certainly is stupid,” tweeted another detractor. “Stephen a smith was speaking facts in his tweets yall are just too ignorant to understand,” wrote one Twitter user. Below is a sampling of some of the negative reaction to Smith’s comments which prompted him to become a trending topic on Twitter throughout Tuesday. (No man. No. Don't do this.) 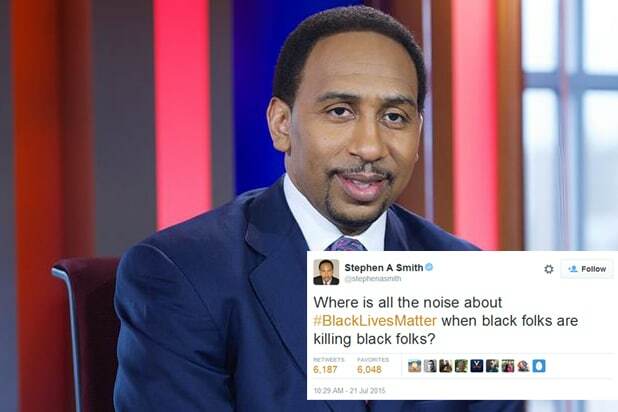 RT @stephenasmith: Where is all the noise about #BlackLivesMatter when black folks are killing black folks? Donald Trump & Stephen A Smith should run as a 3rd party ticket just to see how many crazy people we truly have in America. Stephen A Smith is a clown. I am so bewildered at Stephen A Smith. So disappointed.